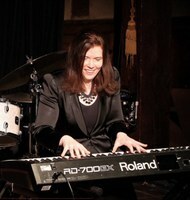 Pianist, keyboardist, composer and arranger Nicole Pesce entertains audiences with her unique blend of virtuosity, humor and pizzazz. Nicole’s YouTube “Happy Birthday Variations” video currently has over three million views. Arizona Foothills Magazine honored Nicole with the “Best of 2014 Award” for Best Local Band/Musician. With a repertoire consisting of over 12,000 memorized songs; Nicole is often dubbed “the human iPod” and is recognized as one of the “top ten musicians to hear in Phoenix” by the Arizona Republic. Nicole has performed for Muhammad Ali, George Benson, Ricky Martin, George Bush, Sr., Waylon Jennings, Taylor Hicks, Janet Napolitano, Shaquille O’Neal, Jimmy Carter, Chris Rock, Steve Nash, The Gypsy Kings, Verne Troyer and Brian Setzer. She’s appeared with American Idol contestant David Hernandez, The Moscow Ballet, Zowie Bowie, The Cast of Mary Poppins, Young Frankenstein, Mamma Mia, and White Christmas.